There is always a move of God in every dispensation. God has something that He desires to do for His glory and for our benefit. In order to to do the works of Christ, we have to leave that which is familiar and that which is secure. We can’t prepare and mature, if we hold on to familiar knowledge. God will always move us into something that is not familiar, not secure, and uncomfortable. His will is always in front of us and it is always outside of our comfort zone. When God asks us to move, it is always something that feels uncomfortable and unfamiliar. 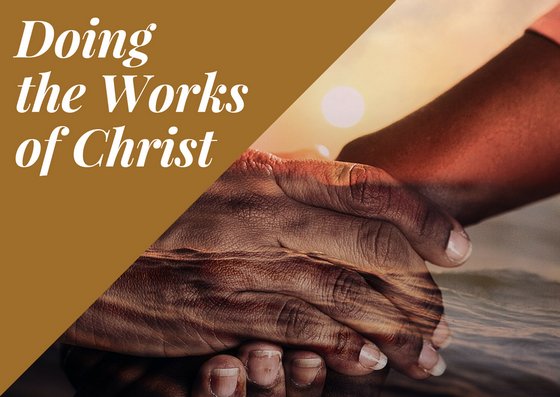 Subtitle: Doing the works of Christ. You are from the Heart. God is more concerned with your heart than He is with what you do. It is your heart that determines who you are. You do out of what’s in your hearts. You speak out of what’s in your hearts. You give your hearts to Jesus. Love is the foundation of from the heart. You show your love to God through your obedience. You show your love through your giving. You believe the Word of God and live according to the Word. If you are going to do what God has called you to do, to be like Jesus, you have no other option than to live a standard of righteousness. Your responsibility is to glorify God and to allow people to see Christ in us. Love causes you to seek and save the lost. The Lord wants you to do greater works (the works of Christ). You are Christ’s body and that is how He gets works done in the earth. In order to do, change must take place. Change is hard and sometimes change hurts. Thanks be to God that Jesus has provided you the power that brings change. b) You can make a difference in people’s lives. Jesus gives us power to change your hearts, the power to change your witness, and the power to change your work. You need to appreciate and take responsibility for the gift that God has given you. When you are grateful, you will use it in your change of your heart, witness, and work. c) You receive power to change by the Holy Spirit. When you receive the Baptism with the Holy Spirit, it lets you see that Jesus is still alive. He dwells with you and in you. He sent another Comforter and He is going to do in you what Jesus did for you while He was on the earth. This is the power of change. d) You can’t grow and mature without the Spirt of God. You can’t be and do what God has created you to be and called you to do out of your intellect. It cannot be done out of human effort and human strength. When you know that Jesus is alive, it is the Spirit of God that brings change, where change is needed and that’s in your hearts. Because your hearts determine where you go and what you do. The Lord wants you to do greater works than He accomplished during His earthly ministry. We are Christ’s body and it is through His body that He gets works done in the earth. In order to do those works, change must take place. Change is possible and you can make a difference. God provided the power that brings change, the power to change your heart, the power to change your witness, and the power to change your world.